This Halloween Is Scaring Up Record Sales of Candy, Costumes And Decor : The Two-Way Surging consumer confidence is spurring sales for Halloween. Retailers are forecasting an 8 percent increase in sales for costumes, candy and decorations. Those gains are strong given low inflation. 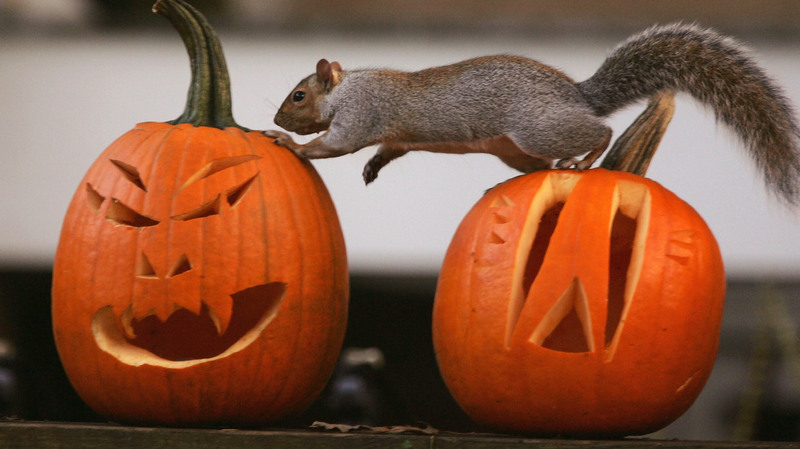 A squirrel investigates Halloween jack-o'lanterns in Washington, D.C. Analysts say spending for holiday decor, candy and costumes is strong this year. This may not be good news for your waistline, but your sweet tooth might appreciate it: Halloween candy sales are crackerjack this year. "Consumer confidence is riding high, so consumers are likely to splurge a little more on edible goodies," David Deull, a senior economist with IHS Markit, said in his analysis of 2017 Halloween spending. Halloween candy sales are expected to rise 4.1 percent from last year, reaching a seasonally adjusted $4.1 billion, he said. The sales increase is particularly impressive given that candy prices have dropped 0.9 percent compared with last year, marking the second consecutive Halloween candy price decline, according to IHS Markit data. "Global cocoa production in both 2016 and 2017 experienced large improvements over each previous year with especially good, and in some cases record, production from major producers in West Africa," Deull said. "This created downward pressure on cocoa bean prices in 2017." And that put more candy in your shopping cart. The National Retail Federation, which surveyed more than 7,000 consumers, estimates more than 179 million Americans will be participating in some type of Halloween festivities, up from 171 million last year. By the trade group's calculations, this year's total Halloween spending - for costumes, cards, decorations, candy and more - will end up hitting a record $9.1 billion, up from $8.4 billion in 2016. The upbeat readings on Halloween sales fit with what most economists are saying about consumers' mood, which has been improving along with gains in hiring, stable retail prices, rising home prices and growing retirement savings accounts. The latest reading of consumer sentiment shows a surge for October, according to the University of Michigan Surveys of Consumers. "The finances of consumers have benefited from low unemployment and inflation rates as well as renewed increases in home values and a resurgent stock market," said university economist Richard Curtin, who directs the surveys. Economists generally say the positive outlook for Halloween bodes well for this year's holiday shopping season, which is a bit longer than most years. In 2017, Christmas falls 32 days after Thanksgiving - one day more than in 2016. And this matters: Christmas falls on a Monday instead of Sunday, giving consumers an extra weekend day to do some last minute shopping. "Although this year hasn't been perfect, especially with the recent devastating hurricanes, we believe that a longer shopping season and strong consumer confidence will deliver retailers a strong holiday season," NRF President and CEO Matthew Shay said. The group estimates holiday sales will be up between 3.6 percent and 4 percent, for a total of between $678.8 billion and $682 billion.